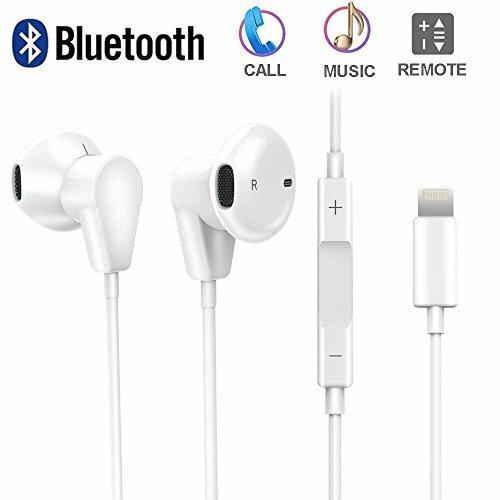 【Premium Sound & Apple Earpods Style Earbuds 】-- Delivers Premium Sound with fine-tuned acoustics that balance strong bass, soaring Highs, and clear mids. With No Distortion and a very natural feel. Built in remote control button and MIC allowing calling function ,music and volume control. Lightning connector is for charging automatically when you connect it, don\'t worry about Bluetooth usage time. 【High-end Technology and Ergonomic design】 -- Built with high-performance speakers for extended frequency range,lower distortion, high performance and noise isolating ear tips eliminate ambient noise.Ergonomic design makes it more comfortable,relevant and cool to put on your ear. 【12 Month Quality Guarantee】 -- Your satisfaction is very important for us. We provide one year Worry-free warranty. If you have any questions ,please contact us, we will response within 24 hours.